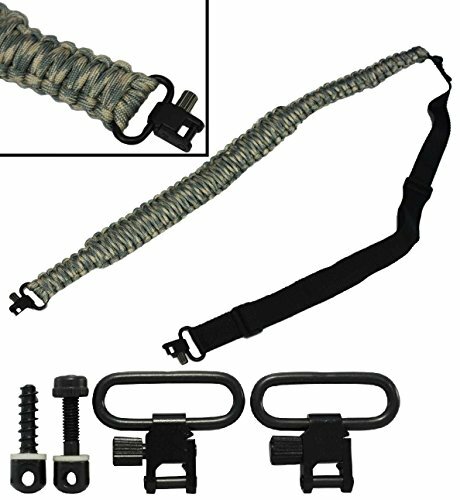 Package Includes: Set of 2 Steel Swivels 1" Wide + Wood Screw Studs 3/4-Inch Screws & 7/8-Inch Machine Screw and Nut for the Forend + 550 lb Paracord Strap. ACU Army Digital Camo Camouflage 550lb Paracord Strap, Material: 58 feet of high quality 7-strand 550LB Paracord (Parachute cord), and 3 feet of breaking strength 100% nylon webbing. Adjustable from 36" Inches to 56" Inches (Approx). Provided with 2 Swivels.